Petkin Itch Stop Wipes for Cats & Dogs provides fast action relief for the itching and pain resulting from flea bites, skin irritations and hot spots. Made with a unique blend of Witch Hazel, Aloe Vera, Comfrey and Vitamins, this cooling relief soothes the irritation and pain that your pet suffers from. With a bitter taste, it also stops your pet licking, scratching or biting at the irritation. Regular use speeds healing and it is completely safe to use 3-4 times daily. 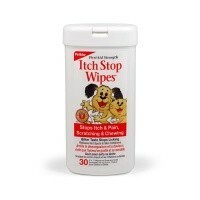 Each pack contain 30 wipes. My dog also has an allergic skin condition exacerbated by dust and storage mites. We manage this now we know the main culprits but he still flares from time to time as he is especially nosey if we're unearthing some long-forgotten toy from the dusty den under some of the furniture we didn't even realise was dusty! These wipes genuinely seem to soothe the itchies and in combination with wound powder from VetUK and his veterinary treatment/regime we seem to be getting on top of it for the time being. Definitely recommended and as the previous reviewer says the bitter element in this product is hard to get off of your hands so wearing gloves is a good idea although often an afterthought in my case! My only problem with this is the dispenser. I don't bother with it any more; not since I got my finger trapped! I've only ever managed to get one wipe out before having to open it up and poke another through. I'm sure there's a knack to it but just takng off the lid is easier for me. My dog has an allergic skin problem and sometimes gnaws at his feet a lot. The taste of the wipe is supposed to deter the dog from licking the cleaned area but I'm not sure that works with Teddy as he tries to eat the wipe as I'm using it! But he does stop licking his feet afterwards so I assume it's because of the soothing effect rather than the taste. But you really need to wash your hands well after using the wipes as the taste will linger - and it is vile.